Song compositions on the album have inspiring lyrics and anointing music. The songs span a variety of musical genres to honor the universal existence of the Heavenly Father and His Son, Jesus Christ. 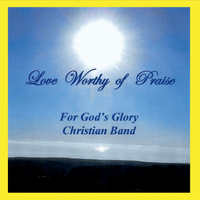 For God's Glory Christian Band is an alternative contemporary Christian band. The band is based in Newburgh, in the Mid-Hudson Valley region of New York State, in the USA. Songs on this album span a variety of musical genres to honor the universal existence of the Heavenly Father and His Son, Jesus Christ.